Änglaholm White Portion Snus is new for Q3 2016 and a truly unique offering not only from manufacturer GNT, but on the Swedish market today. It features the Cornel berry; yet another fruit Americans have probably never heard of. This is a premium snus and will certainly join the rotation of me, Moe Unz! 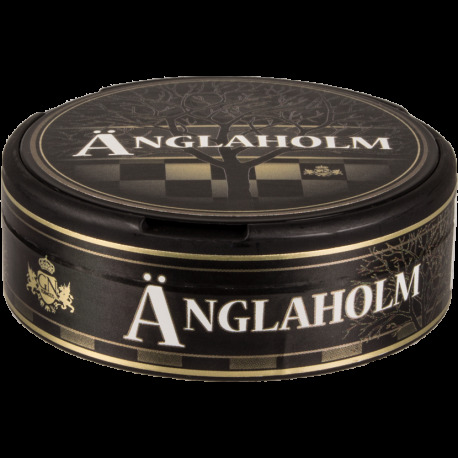 Änglaholm White Portion Snus, named after the Swedish town of Anglaholm for unknown reasons, is a real snus treat. The style reminds me of the now-departed Roda Lacket White Portion but with Cornel berries as the fruit flavoring. Cornel berries have a sweet/sour cherry-like taste. To me, Moe Unz, it is perfect balance and not overpowering cherry at all. The flavor is there but like Änglaholm White Portion Snus, it is tempered and melded with the tobacco and a dried fruit flavor which caresses the pallet without being overwhelming. On paper, this is a strong portion snus at 1.2% nicotine but it feels like a 0.8mg nicotine snus in practice. I have decided to classify Änglaholm White Portion Snus as a regular strength; not a strong snus here at the SnusCentral.com Snus Shop. I have a special selection of berry and fruit flavored snuses I alternate with in my regular rotation. Änglaholm White Portion Snus has joined that elite group. This is a good fruit snus with light cornel (slight cherry) undertones and salty tobacco only issue I have with it is the taste seems to fade fast 35-40 minutes. But I can recommend it if you like traditional snus but want something with a different flavor. Love this stuff. Great taste. Just right in every way. Plus, it lasts forever. One year shelf life. Anyway. Good stuff. However, would really like to see GN increase the amount of Snus just a bit. Or decrease the size of the existing portion material. After breaking up the clump of Snus in the portion, it just looks like there’s some product missing. Just add a bit more and you have a perfect product. The flavor is great -- it tastes a lot like the center of a cherry mash candy which some people from the US may know. However... the pouch is sized weird, and it's WAY too abrasive! If they released this in a slim portion, it would be a 5/5. I was initially really impressed with this one. The cornel berries really do taste like cherries, although I didn't get the sour tang flavor. My issue with it was that it started giving me a headache every time I had one. This on top of the cornel flavor being so forward that every satchet was just cornel world--a kind of cloying sweetness that never really changed or had much depth--makes it hard to recommend. I really enjoy this snus. It has a very pleasant taste of fruit and tobacco. It's mild so sometimes I'll throw two in depending on how I feel. and I liked it. I didn't get as many berry notes as others are saying, but it did taste refreshing. I received this in a Bag o' Snus random pack from my last order and a roll just went into my cart. When I first started using snus, I loved the sweet ones...but with time, I eventually gravitated more towards tobacco flavored snus. This hit that near perfect spot for me these days, where the snus doesn't taste sweet and offers a nice tobacco flavor, but has a deceptively sweet aroma and just a faint taste of this so called cornel berry. I hope this one sticks around because I can see myself putting in for a roll every order. This snus is fantastic, and a new favorite of mine. The fruit is perfectly balanced with the tobacco, and not particularly sweet at all. It seems tricky to do, most of them are either too week on the fruit, or more often obnoxiously overpowering and sweet. It's the only fruit snus I've tried which I can happily use all day. Great stuff. Very unique flavor - fruity, with a pleasant mild tobacco background. I'd compare it to Nick and Johnny Americana, but I think I like this better. Very good and worth trying. Tastes like strawberries with a mild tobacco background. Plump portions but a little too dry for my tastes.